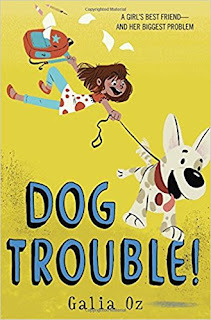 Today I have a book tour blast for the children's book Dog Trouble! by Galia Oz. 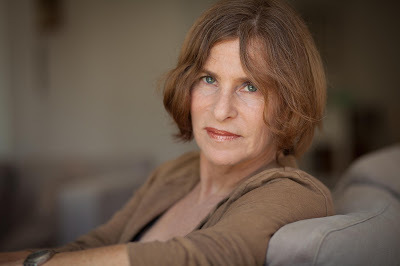 "I wanted to mow down the politically correct" by Galia Oz, about DOG TROUBLE! You can purchase a copy from Amazon HERE. My puppy, Shakshuka, disappeared. It happened when my dad was away on a business trip and my mom was in one of her worst moods ever because Max and Monty had both just had their vaccinations and they both had reactions and they didn’t sleep all night. Max and Monty—I called them the Munchkins for short— were babies and twins and also my brothers, and every one knew that if there were two babies in the house, no one was going to pay any attention to a dog, even if she was only a baby herself. At night, I lay awake in bed and I was cold, and I remembered that once on TV I saw pictures of a hun-gry dog that was really skinny whose family went on a vacation and left him tied to a tree. And they said that the SPCA couldn’t take care of all the dogs that were abandoned by their families. And I thought about Shakshuka, who was gone and might be tied to a tree at that very minute, hungry and missing me. The next morning in class, Brody told me there was no way that Shakshuka had been stolen. “No way, Julie!” he said. “Why would anyone bother? You could get five dogs like her, with spots and stripes, for less than ten dollars.” Or maybe he said you could get ten dogs like her for less than five dollars. Brody said things like that sometimes, but most of the time he was okay. When Max and Monty were born, he said that was it, no one at home would ever pay attention to me again, and when I cut my hair short, he said it was ugly. I turned my back on Brody and pretended to listen to Adam. He sat at the desk next to mine and spent his whole life telling these crazy stories. Adam said, “My father won ff-fifty thousand, do you get it? In the lottery. He’s ggoing to buy me an iPP . . .” People didn’t always listen to Adam because he stuttered, and they didn’t always have the patience to wait until he got the word out. This time Brody tried to help him finish his sentence. Brody called Adam “Ad-d-d-dam” because of his stutter, and because he liked to be annoying. But he was still my friend, and that was just how it was, and anyway, there were lots of kids worse than he was. That Danny, everyone was afraid of him. And they’d have been nuts not to be. It was bad enough that he was the kind of kid who would smear your seat with glue and laugh at you when you sat down; that he and his friends would come up and offer you what looked like the tastiest muffin you’d ever seen, and when you opened your mouth to take a bite you discovered it was really a sponge. But none of that was important. The problem was, he remembered everything that anyone had ever done to him, and he made sure to get back at them. The day before Shakshuka disappeared, Mrs. Brown asked us what a potter did, and Danny jumped up and said that a potter was a person who put plants in pots, but Mrs. Brown said that was not what a potter did. And then I raised my hand and said that a potter was a person who worked with clay and made pottery. I could have told on him for kicking me in the yard as well. My bag flew off my shoulder and landed right in the middle of a puddle, and Mom was really angry at me when I got home because we had to take out all the books and leave them out to dry and we had to wash the bag. I really could have told on him, but there wouldn’t have been any point. It would just have meant another note for him, another kick for me. “You look as if you were in a fight with a tiger.” That was so close to the truth that I blurted out the whole story about what happened with Danny. And I was really sorry I did that because that was the reason Shakshuka disappeared. Mom spoke to Mrs. Brown and she must have told her I was black-and-blue after Danny pushed me because the next day at school Mrs. Brown took me aside and told me that I had to let her know whenever something like that happened because otherwise Danny would just keep on hitting me, and other kids too, and we had to put a stop to it. Mrs. Brown meant well, but I knew that when it came to Danny, I was on my own. Danny must have seen them too because he let me go, and when I stood up he looked at me and started laughing, probably because of the dirt on my face, and I decided I’d had enough of this jerk. I saw red, no matter where I looked I saw red, and without think-ing about what grown-ups always taught us—that we shouldn’t hit back because whoever hit back would be punished just like the one who started it—I threw a plant at him. Danny said I was a liar, but Mrs. Brown took one look at my dirty clothes and she believed me. And be-cause of me he got into serious trouble. They didn’t only make his parents come to school and suspend him for a day—after the incident with the plant they also told him he’d have to start seeing this really horrible counselor every Wednesday. The kids who knew him said his office stunk of cigarettes and he was a real bore. Many thanks to Pump Up Your Book and Galia Oz. It was a pleasure hosting!